I've had mixed feelings about offering accounting classes in a liberal arts college economics department. Liberal arts colleges don't typically offer accounting majors or have accounting departments, but an accounting course or two might be on the books in the economics department. The reason for my reservations about it is that I worry that it reinforces a mis-perception that studying economics is more "vocational" or "practical" than other parts of the liberal arts curriculum - i.e., that an economics major is somehow a proxy for getting a business degree. However, there is a good case for liberal arts students learning about accounting - financial statements are an important source of information in our society, so being able to interpret them is valuable for anyone who might want to (critically) examine the activities of businesses or the government. “the business cycle” has become shorthand for the series of irregular, short-run, aggregative fluctuations of varying duration, magnitude, and—probably—causation that we call prosperity and recession. That's from Solow's delightful 2007 review of Thomas McCraw's biography of Joseph Schumpeter, which I had the good fortune to stumble upon. The NBER's somewhat mushy "official" definition is here. The fiscal policies enacted by the Reagan administration included significant cuts in taxes and increases in (military) spending. Illustrate the effects of this fiscal policy using an IS-LM diagram. The red line (right-hand scale) is GDP growth, which is negative in 1982, but strongly positive in 1983 and 84 ('Morning in America'), and the blue line is the federal deficit as a percentage of potential GDP, which shows the effect of Reagan's fiscal policy. 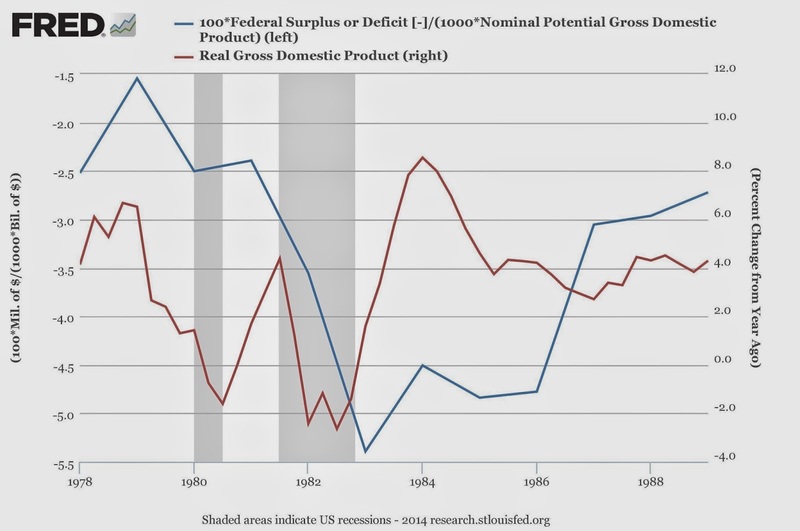 In strict terms, Reagan’s neglect of the deficit wasn’t Keynesian. Keynes himself believed in letting the deficit rise in a recession and paying down debts in the good times. In America, though, Keynesianism has always been associated with stimulus programs, big government, and deprioritizing the deficit. In all of these ways, Reagan was a Keynesian. But a word to the wise: don’t waste your time trying to tell that to anybody in the Republican Party. This week's Employment and GDP releases sent some very mixed - even more than usual - signals about the economy. The good: Employment rose by 288,000 in April which is above the average of 194,000 since January 2012, and the February and March employment growth estimates were revised upward slightly. "The drop in participation is not due to discouraged workers leaving the labor force," a Department of Labor spokesperson noted, "it's due to re-entrants and new entrants who we expected to see flowing into the labor force, and who didn't this month." 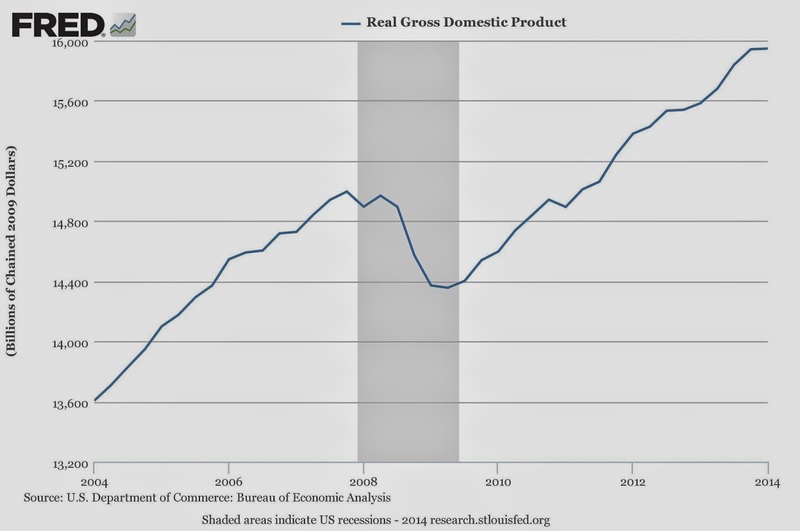 The ugly: Wednesday's advance estimate from the BEA put real GDP growth at an 0.1% annual rate for the first quarter. Consumption grew at a 3 percent rate; the biggest drag was investment, which fell at a 6.1% rate (mainly due to declines in equipment and housing investment as well as a decrease in inventories, which is counted as a negative investment), and exports, which declined at a 7.6% pace. [T]he Census Bureau released new data on construction spending that were weaker than not only the consensus forecast but also the government’s estimates in its calculations of the nation’s gross domestic product. Ben Herzon of Macroeconomic Advisers said core construction -- which doesn’t include residential improvements and federal spending -- was soft in March, while the numbers for the first two months of the year were revised lower. According to Macroeconomic Advisers’ analysis, that means instead of the 0.2 percent boost in private nonresidential construction spending assumed in the GDP calculation, there was likely a 5.7 percent decline. Ouch. In addition, new data show retail sales were also slightly softer than expected, translating into a 2.9 percent increase in consumer spending instead of a 3 percent rise, Herzon said. Overall, the mixed signals highlight one of the reasons why "fine tuning" macroeconomic policies are difficult (at best): the "recognition lag" in identifying changes in the state of the economy. Economic statistics are backward looking, based on surveys (which means there's some statistical "noise" - there's a great illustration of this at The Upshot), and subject to substantial revision. Right now, the GDP figures look like a recession warning sign, but the employment numbers are consistent with the (slow) recovery continuing on. 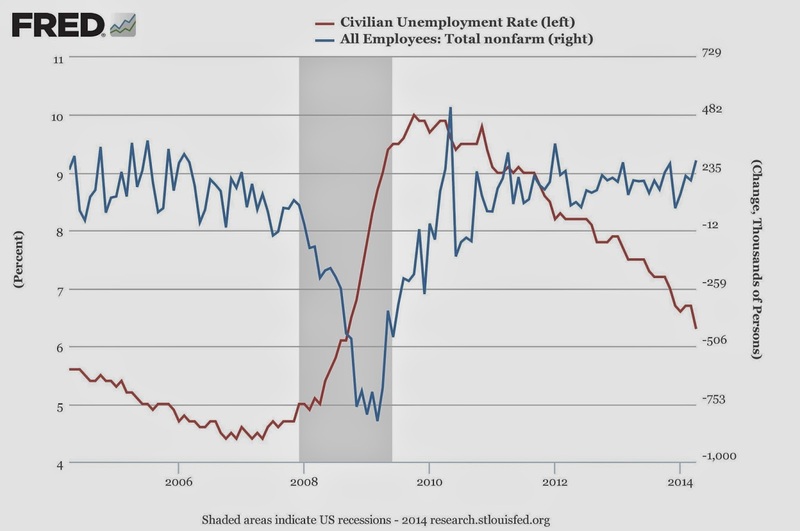 Of the data we have so far, the payroll employment figures are probably the most reliable. Average growth was 190,000 jobs over the first three months of the year, so despite the construction and retail sales data noted above, I'd expect the GDP figure ultimately to be revised upwards. We'll get the "second estimate" on May 29. "What we tend to see, and this is my operating hypothesis of what's going on, this time of year we traditionally expect to see certain types of people flowing into the workforce, and those people are seasonal workers," he says. The people seeking out that seasonal work start to ramp up their searches later in the month of April, he says. However, the survey week in which the government asks US households whether people are working fell as early as it possibly could have last month. That's because the household survey week is the calendar week in which the 12th of the month falls. But the 12th landed on a Saturday, meaning households were surveyed from April 6-12. "The people we would traditionally expect to see flowing into the workforce at this time have not yet entered the workforce," he says.